This week’s focus is on CANTALOUPE. Now this is a flavor that is most popular on its own. The Top 5 would consist of Cantaloupe Slush, Cantaloupe Shake, Cantaloupe Green Tea, Cantaloupe Black Tea or Cantaloupe Milk Tea! SO basically, everything Cantaloupe! For the adventurers, here are a few ideas on what to mix in with Cantaloupe! We like mixing other melons with Cantaloupe! What is in our Puss in Boots and Fiona? Puss in Boots is Orange, Peach and Apple flavoring. Fiona is Apple, Lychee and Blue Curacao flavoring. Flavors that go well with BLUEBERRY!!! You are the PINEAPPLE of my eye. Honey, dew you love me? 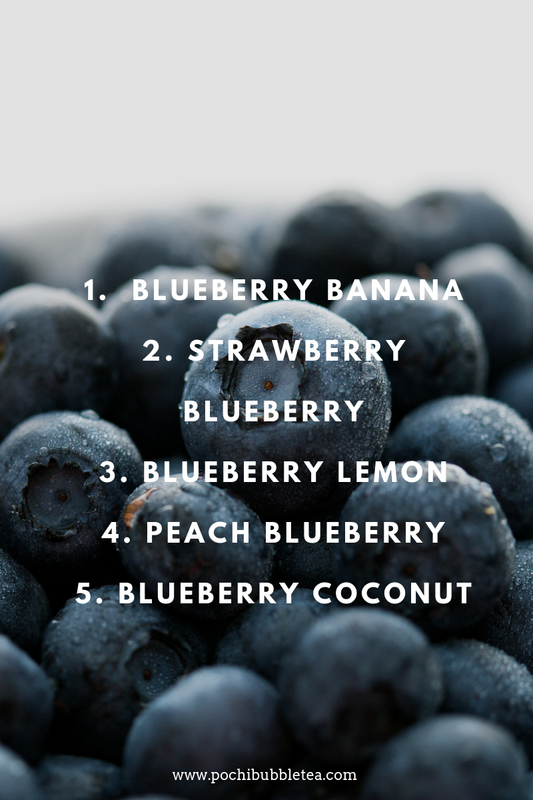 Check out our Top 5 Flavor Combinations with Blueberry and continue down further for more combinations! Check us out on INSTAGRAM if you want to see more of what everyone is getting on our Stories! Asian pears are often referred to as apple pears because of their unique taste and texture! Asian Pear flavor is amazing on its own. 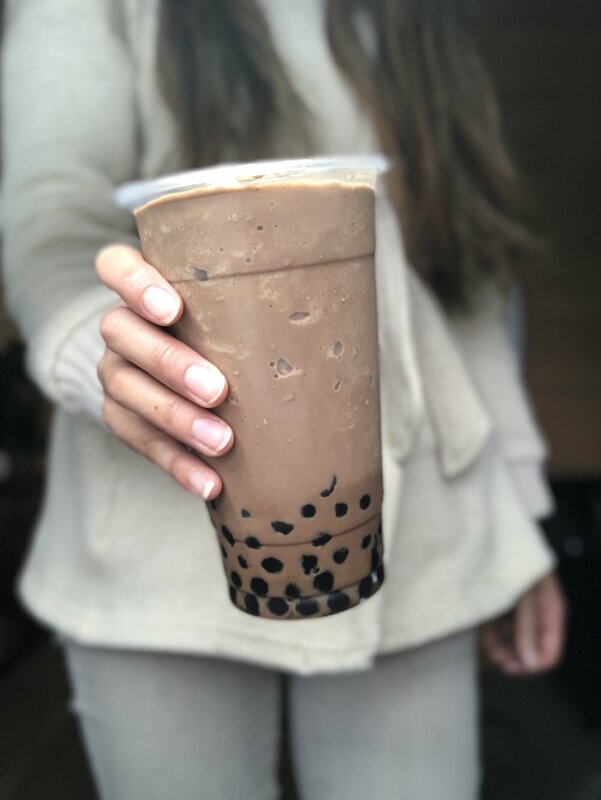 It is really popular enjoyed in all 4 different types of bubble tea we serve, creamy shake, icy slush, milk tea and iced tea! The weekends in the Fall are always so much fun at Pochi. We get to see everyone who’s in high school after homecoming games and dances! And if you are in college, we heard it’s about that time for mid-terms! Good luck to all of you! 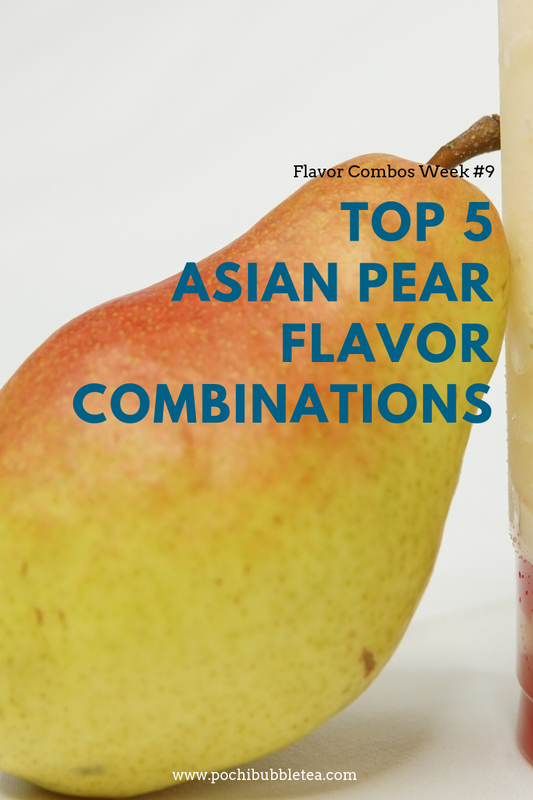 Check out our Top Flavor Combinations for Peach. Continue down to a list of even more combinations. Hope it sparks some ideas for you. We always love hearing from you all! Let us know what your favorite peach flavors are! Leave us a comment or message us on Instagram!! Is there a peach flavor combination that’s not on here? If so, what is it? We’d love to try it! 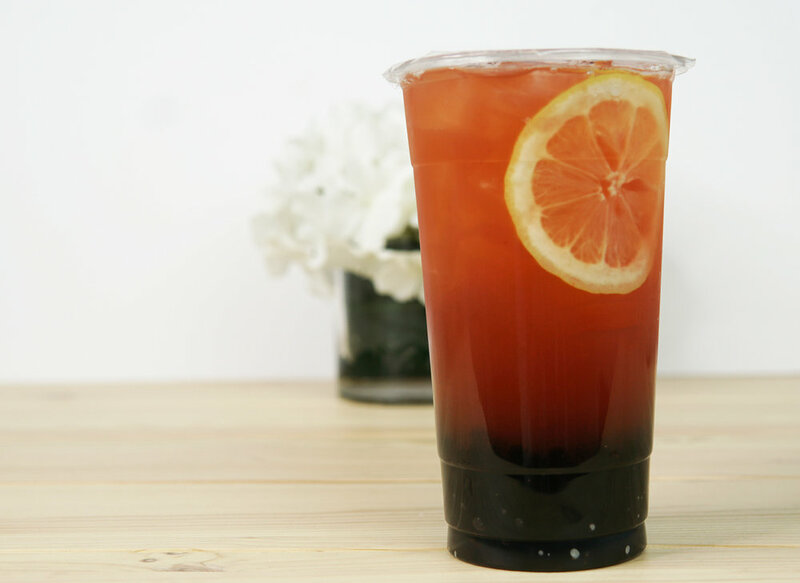 Into the 7th week of giving you some drink ideas for our bubble teas!! Let us know if there’s a flavor that you want us to cover next!! Pineapple is such a tropical flavor and pairs well with other tropical fruits! Coconut is such a popular flavor to mix with pineapple too. Out of the Top 5 Flavor Combinations, 3 of them contain coconut! If you still need more drink ideas, check our previous posts on different flavors below! Or follow us on INSTAGRAM! Honeydew Shake is among our ALL TIME most popular flavor ordered at Pochi! In fact, it’s in our Top 10 List and have consistently been there so we know it’s a good flavor to suggest to you! Did you know that honeydew is one of our favorite fruits to cut? We cut up fresh honeydew to add in to your honeydew drinks! They happen to be one of our favorite fruits to cut because they are a no-nonsense and easy fruit to cut! We make our Honeydew Shakes with a Honeydew Flavoring (Powder Based) and add in real honeydew fruit! We will soon have available Honeydew Syrup! YOU heard it here first! This will be especially exciting for those who would like to have Honeydew as a Slush and not as a Shake! (For more info about the difference between a Slush and Shake HERE) We currently do not serve Honeydew as an iced tea, so having the syrup will allow us to do so!! So exciting and a lot more bubble tea deliciousness to choose from! This is our 6th week posting flavor combinations. We hope you’re enjoying it as much as we’ve had in putting these all together for you. We hope these posts each week has inspired you to venture out of your comfort zone and try a new flavor. Or come up with a concoction of your own! Let us know what you think or let us know what you want to see more of on the blog! Comment below or DM us on Instagram! Orange is always a refreshing, citrus flavor! It brightens any cup of bubble tea! Find out our Top 5 below! We get all kinds of reactions when people find out about our Avocado drinks! Some people ask if we use REAL avocados or avocado powder. Others give us a strange look and ask if it tastes any good. I love explaining our Avocado Drinks because we DO use real avocados and YES, it is totally yummy!! 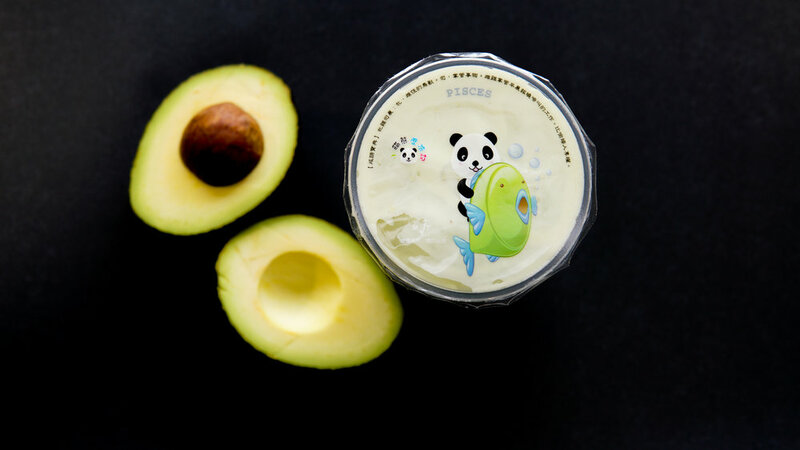 The fresh avocado makes our shakes super creamy and smooth. It blends well with other flavors as well. 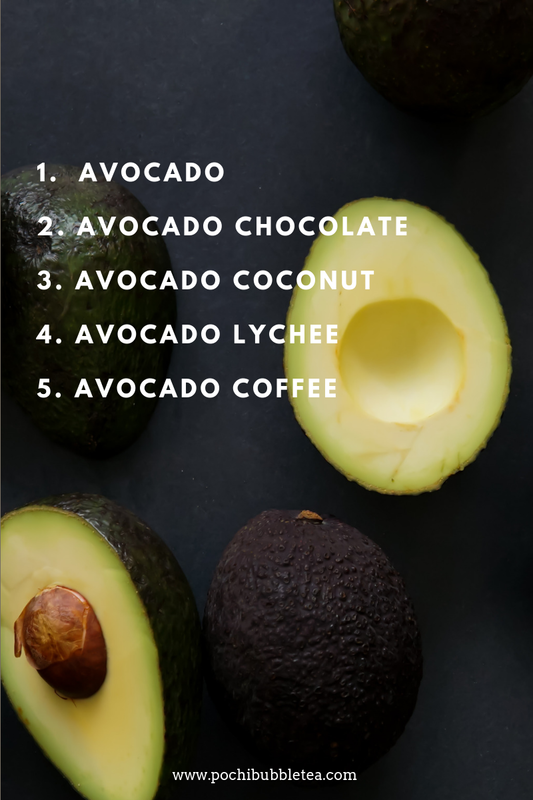 And if you’re still hesitant to try, Avocado Chocolate Shakes are among our Top 10 Drinks of ALL TIME! A regular avocado shake is my personal fave when I’m looking for a filling drink or light snack to hold me over between meals! We add in real mangoes into ALL of our blended mango drinks! Our coffee drinks are made with a coffee flavored powder. There is no caffeine in it, which is a pleasant surprise for many who crave the flavor but not the caffeine kick. For those who WANT the CAFFEINE, we are very excited to announce that we will be offering COLD BREW as an Add-On to drinks! 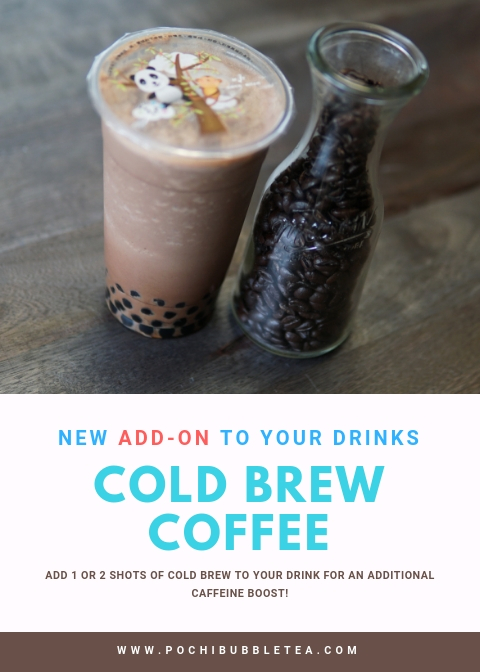 You will have the option of adding 1 or 2 shots of cold brew to any of your bubble tea. We are very intentional on what we decide to offer as every new item may affect various facets of how we operate. Our specialty is BUBBLE TEA. We are and will always focus on offering awesome bubble tea for you! As cool as it would be to offer iced/hot coffee, it just isn't what we do best. We do bubble tea best and that's our biggest commitment to you. Coffee Shake w/2 shots of Cold Brew. Coffee Jelly. We heard you last week! Thank you for participating in our poll on Instagram when we asked what you wanted to see more of on the blog. So many of you asked about different "flavor combo ideas", "crazy concoctions", or "cool/unexpected new drinks"! We have a LOT of flavors. So, here's what we're going to do. Each week, we are going to highlight 1 Flavor. 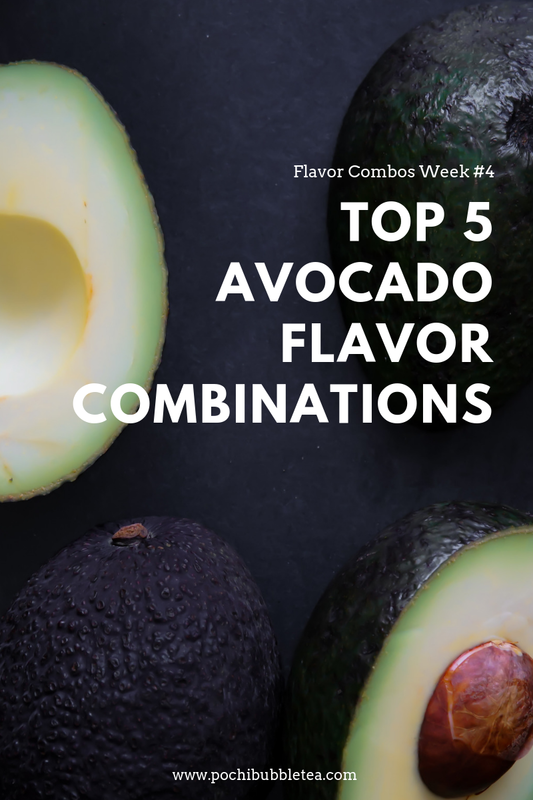 We will give you the most popular combinations with that flavor, the unusual/unexpected flavor combinations and perhaps some of our faves as well! Kicking off the 1st week ever is STRAWBERRY. Can Bubble Tea Be Healthy?! Modify your sweetness level or cut it out. At Pochi, we are able to adjust your sweetness level to 1/4 sugar, 1/2 sugar, 3/4 sugar, regular sugar or no sugar added. In fact, we can also do extra sugar, if you're not watching your sugar intake. To stay on our topic of healthier options, we can also substitute sugar with honey or Splenda. Choose dairy or an alternative. 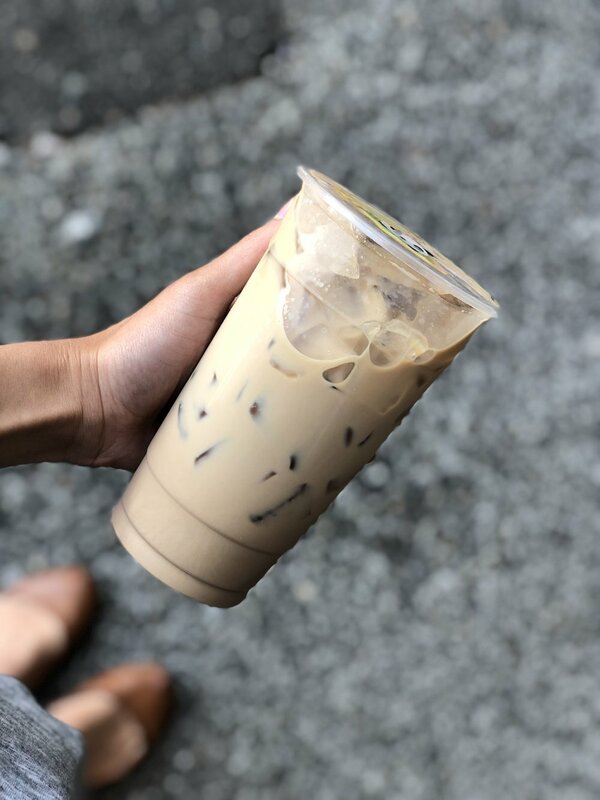 We use a non-dairy creamer for our Creamy Shakes and Milk Teas. However, you may substitute that for whole milk, almond milk, soy milk, or coconut milk! The almond, soy, and coconut milks are also a great option if you have a dairy allergy. Choose less or no toppings. Part of the experience and joys of bubble tea are the Tapioca Pearls (Boba) that go on the bottom of the drink. If you've been to Pochi, you also know we have a LOT more options than just the Tapioca Pearls. Although our jellies are Gluten Free, they do contain added sugar. Tapioca Pearls also contain quite a bit of carbohydrates. We suggest opting for less than the usual amount if you're watching what you're drinking a little more closely. We can do no toppings, 1/4 amount of the topping, 1/2 amount or the full amount. The option is all yours! These 3 modifications to your bubble tea may not just apply to drinks at Pochi. If you visit another bubble tea shop, ask if they could make any of these modifications for you as well. Fresh Watermelon Slush (Summer Only) - We use fresh watermelon each Summer. It's one of our Summertime Fave's! We use only 3 ingredients! Watermelon, ice and sugar syrup. Make this even healthier by cutting out the sugar or reducing it! Super refreshing drink! Honey Green Iced Tea, No Sugar Added - A nice, cold iced tea lightly sweetened with honey. If it's not sweet enough for you, ask for a little extra honey. Black Milk Tea, Sweetened w/Honey, Sub Almond Milk - Our original milk tea is a main staple here at Pochi. For a lighter twist on this classic drink, substitute the sugar for honey (or Splenda) and instead of our non-dairy creamer, ask for Almond Milk! Fresh Avocado Shake, Sweetened w/Honey, Sub Coconut Milk - We use FRESH avocados year round! The non-dairy creamer definitely makes this drink really creamy but if you can do without the creaminess, ask for Coconut Milk or Almond Milk! One of our most popular bubble teas is Taro. Anything with Taro is very popular, in fact, but what is it exactly? 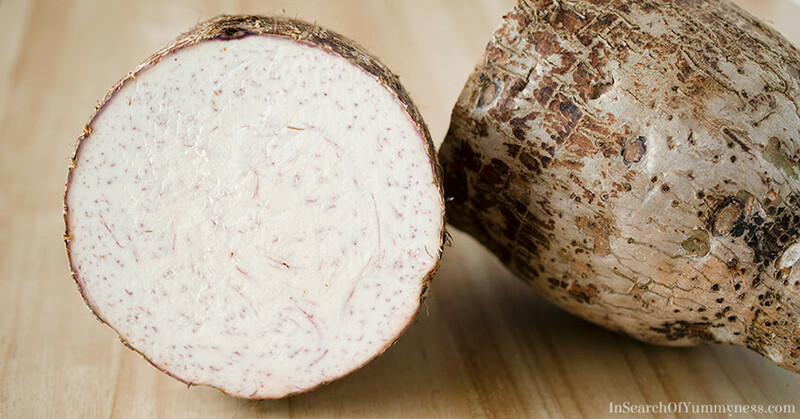 Taro root is from the tropical, taro plant (Colocasia esculenta). It is believed to be native to Southern India and Southeast Asia, however it is widely cultivated in other parts of the world as well. It has been a staple in many different cultures for thousands of years as it is also believed to be one of the earliest cultivated plants. Taro Root and its plant leaves are toxic when raw. Once cooked, they are safe to consume and has a similar consistency/texture to potatoes. The flavors of taro are described to be very earthy and nutty. Taro also has some light purple coloring in its flesh, which is why most Taro Bubble Tea drinks are purple in color. There are so many ways to prepare and use Taro though. It is great in desserts or cooked similar to a potato. Take advantage of the rest of Summer with a few of our favorite Summer drinks! 2. 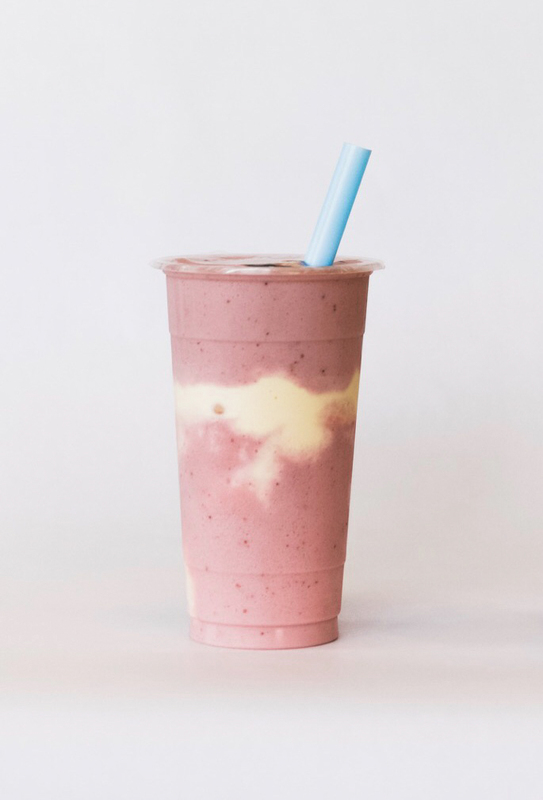 Tropical Cooler – This is your fruit milk tea with a twist! Pick one or two fruit flavors. Decide if you would like any tea. Totally optional, but we do have green tea, black tea and oolong tea! We will make your Tropical Cooler with your chosen flavors/tea and top it off with Silk Coconut Milk. Don’t forget to shake this drink up when you get it! Such a light and tropical drink! 3. Blue Hawaiian – While we’re on the topic of tropical, this one is a classic! Pineapple and coconut combined with Blue Curacao syrup! Great with any of our popping bobas or flavored jellies! 4. Fruity Pebbles – Taro, Orange and ice cream come together to give you a reminder of childhood favorite! Topped off with actual Fruity Pebbles too. 1. Watermelon Icy Slush – We only carry fresh watermelon in the Summer! 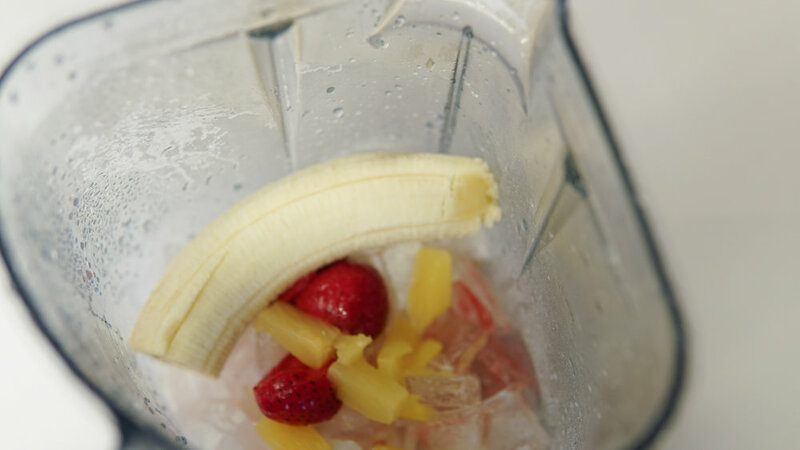 This is our go-to summer drink, especially on a hot day! It is thirst-quenching and oh-so refreshing! Pair it with Aloe Jelly or one of our popping bobas. Once Summer is over, we’ll have to say our goodbyes to fresh watermelon and hello to watermelon syrup. 5. Avocado Shake – Yes, that’s right! Last but definitely not least, our.... A V O C A D O ! We use FRESH avocado which can scare some people! We promise, it doesn’t taste like you’re drinking a vegetable. It’s actually incredibly smooth and creamy in texture. PS. These are just a few of our faves! Did you know you can blend ice cream to any of drinks! It makes any drink super creamy and decadent!